Saltimbocca is an Italian dish that literally means “jumps in the mouth.” My Zia Maria made a simple saltimbocca by layering prosciutto and basil over veal cutlets, holding all together with a toothpick and sautéing both sides in butter and olive oil. A splash of white wine to deglaze the pan and dinner was on the table. At culinary school, I used sage instead of basil and dredged the cutlets in flour before sautéing. 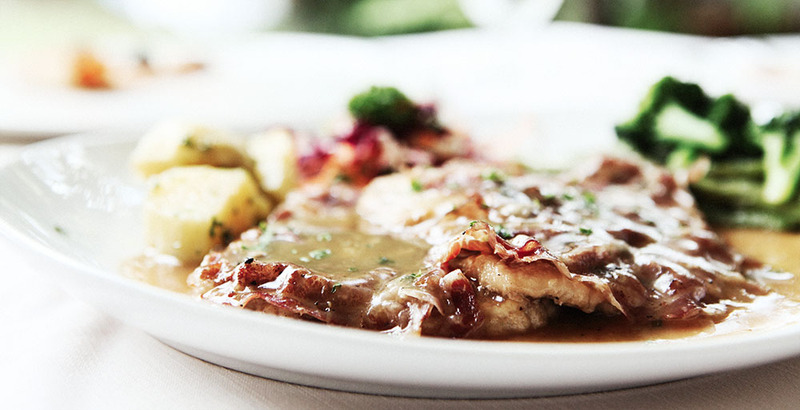 The following recipe is a different version of saltimbocca, using chicken and deconstructing the dish by adding the prosciutto and sage to the sauce. A word about deglazing: alcohol can ignite near a flame. Always use caution; don’t pour the alcohol straight from the bottle. Transfer the amount you need to a measuring cup and pour carefully without splashing. If desired, remove skillet entirely from burner before pouring. Pound each chicken breast with a meat mallet until 1/4-inch thick. Season with salt and pepper. In a large skillet, in hot oil, sauté 2 fillets at a time over medium-high heat until golden on each side, about 3 minutes per side. Remove from skillet and keep warm in oven. Add mushrooms to skillet, adding more oil if needed. Sauté mushrooms until softened and starting to brown, about 5 minutes. Add garlic and sauté 1 minute. Deglaze the pan with Marsala, scraping up any browned bits. Add stock and bring to a boil. Lower heat; simmer, uncovered, until liquid is reduced, about 5 minutes. Remove skillet from heat and stir in prosciutto and butter. Season with salt and pepper to taste. Arrange chicken on a platter. Pour sauce over chicken. Garnish with chopped sage. Serve with buttered tagliatelle. Match: Uncork a Pinot Grigio. Buon appetito! Quench Food Editor, Nancy Johnson, minced, sliced, chopped, sautéed and sipped her way through George Brown College’s culinary program with a focus on food writing and wine. Nancy cooks by the code her Italian grandmother taught her: For the best results, always use the freshest, best ingredients. She writes for Ohio-based Wine Buzz Magazine and recently published a short story in Woman’s World Magazine. She is always on a diet.